The demand within the global market for chronic myelogenous leukaemia treatment has been rising on account of advancements in the worldwide healthcare sector. The presence of a robust domain for cancer treatment is expected to improve the chances of market growth. The vendors operating in the global chronic myelogenous leukaemia treatment have made concerted efforts to improve their revenue index. The relation of the global chronic myelogenous leukaemia treatment market to the healthcare industry is a key consideration for the market vendors. The established vendors have succeeded by tying up with leading medical institutes and healthcare facilities. Furthermore, research and development activities in niche areas have also improved the growth stakes of the leading vendors. It is expected that the global chronic myelogenous leukaemia treatment marker would witness new mergers in the years to come. This projection is based on the quest of small vendors to turn lucrative by joining hands with the large and established companies. Furthermore, the global chronic myelogenous leukaemia treatment market is also expected to witness the entry of new vendors in the years to come. The entry of new players in this market is slated to fragment the global chronic myelogenous leukaemia treatment. Some of the key vendors in the global chronic myelogenous leukaemia treatment market are Teva Pharmaceutical, Novartis, Bristol Myers Squibb, Pfizer, and Hoffman-LaRoche and Schering Plough. Transparency Market Research (TMR) finds that the global chronic myelogenous leukaemia treatment market would expand at a starry CAGR of 6.7% over the period between 2017 and 2026. Furthermore, the global market for chronic myelogenous leukaemia treatment is expected to touch a cumulative value of US$ 8,550.8 million by 2026-end. On the basis of treatment type, symptomatic treatment has gained popularity over disease specific treatment. Based on geography, the market for myelogenous leukaemia treatment in North America has been rising at a stellar pace. The global market for chronic myelogenous leukaemia treatment has been expanding at a stellar pace over the past decade. The commencement of new trends in the healthcare fraternity is responsible for the growth of the chronic myelogenous leukaemia treatment market. Furthermore, disease treatment is a sub-domain within healthcare that has garnered the attention of regional and international investors. This factor has brought in voluminous revenues into the global chronic myelogenous leukaemia treatment market in recent times. Advancements in the field of oncology have also reeked of growth within the global chronic myelogenous leukaemia treatment market in recent times. Owing to the effective marketing tactics adopted by major drug manufacturers, the demand for branded drugs has been on a rise. This factor has also created tremendous opportunities for growth within the global chronic myelogenous leukaemia treatment market in recent times. Hospital pharmacies have become key sellers of drugs and therapeutics for the treatment of chronic myelogenous leukaemia. This is another key dynamic of growth prevailing in the global chronic myelogenous leukaemia treatment market. 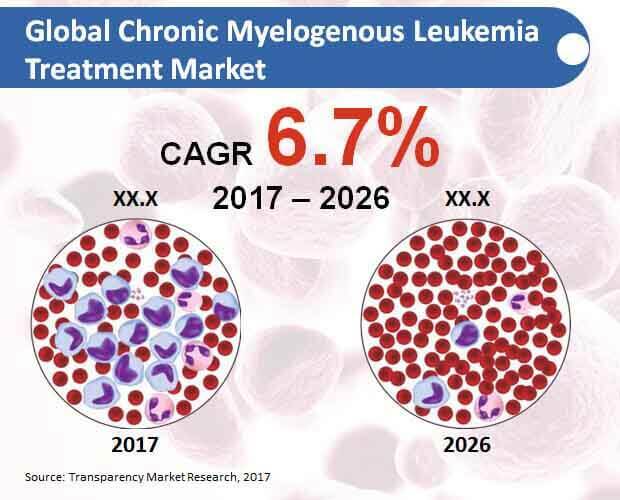 It is expected that the market forces of demand and supply would favour the inflow of revenues into the global chronic myelogenous leukaemia treatment market. The review is based on TMRs’ report titled, “Chronic Myelogenous Leukemia Treatment Market (Treatment Type - Disease Specific Treatment, Symptomatic Treatment; Distribution Channel - Hospital Pharmacies, Specialty Pharmacies, Retail Pharmacies; Drug Type- Branded, Generic) - Global Industry Analysis, Size, Share, Growth, Trends and Forecast 2017 – 2026”.